ALL the best Taifa Stars as you face Cape Verde in the 2019 AFCON qualifiers match in Praia today. The vital win will put Tanzania in a good position as we are yet to record a victory so far. The barren away draw with Uganda Cranes in the group L favourites, in Kampala had convinced us that our national team can grab one of the tickets to play in 2019 AFCON finals. The away draw revived the team's hopes of q ualifying for the finals of the premier continental competition, and as well makes the possibility that Cape Verde are beatable at their home. Why Uganda Cranes test is considered vital in judging Taifa Stars performance is due to a simple fact that they beat Cape Verde at home, something we see also assailable for Stars. Stars, who tie Lesotho on two, must now build on the success with good preparations before facing their next opponents, Cape Verde today in Praia and then October 16 in Dar es Salaam. Though the plan to take 250 supporters to cheer the team in Praia didn't go as planned, players and the technical bench should know that every Tanzanian is with them there though not physically. They must, therefore, avoid losing points at this crucial stage if they hope to q ualify for the Afcon finals for the first time since 19 80. But there is hope of victory over fairly ranked Cape Verde in both away and home encounters. Previously Taifa Stars lost much of the public's imagination and interest after the team's unsatisfactory performance, but not this time when we have many professionals and a good coach. The best way to win back support is to ensure that Taifa Stars win matches, especially at the competitive level. 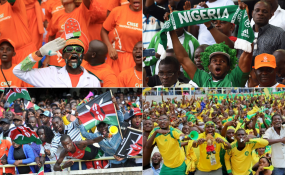 Tanzanians want to see their national team playing in the African finals after over three decades out of it. They also crave to see their team feature in the World Cup and win the trophy.